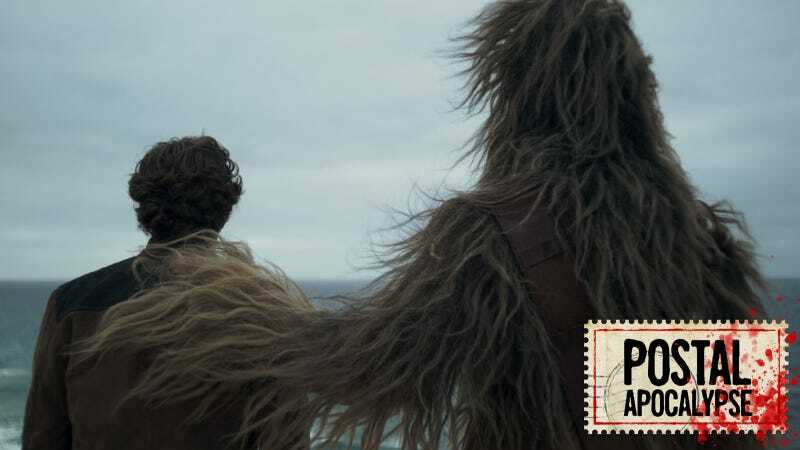 Postal Apocalypse: What Was Solo's Problem? Walking carpet consoles nerf herder. My question is “Why did Solo do so bad?” Was it a bad movie, too soon after TLJ, the controversy of the change of directors, all, none, or some of the above? I liked it. Most of this was Disney’s fault. Scheduling Solo a mere five months after The Last Jedi was dumb because the general public hadn’t had enough time to get excited about another Star Wars film yet. People weren’t hungry for a new movie like they had been for the sequels and Rogue One. All the rumors about the troubled production and the late director switch to Ron Howard also meant that people were also a little skeptical about Solo anyway, so the movie was beginning way behind the starting line. If Disney had done a big marketing blitz for the film, Solo would probably have still been fine, but it didn’t even try to try to market Solo until after The Last Jedi had premiered. Hell, the first trailer came out on February 5, 2018, essentially limiting the main advertising campaign to a mere three months—and even then Disney still half-assed it. It was like Disney assumed having the Star Wars logo on the movie was enough marketing unto itself. That was true, once, but not in the days when a Star Wars movie comes out once a year (or sooner). But the real killer was Avengers: Infinity War. Disney dumped a ridiculous amount of cash marketing that film, and left Solo to essentially fend for itself. Shockingly, the movie that united just about every single character in the Marvel Cinematic Universe was hyped to ludicrous levels, ensuring that it would be a blockbuster supreme—and then Disney thought it was a good idea to dump Solo two weeks after it for some reason, ensuring it was submerged in the ongoing Infinity War mania. Maybe if the movie had turned out really good, it could have captured some heat after it premiered, but it was just fine. As I predicted, Ron Howard turned out a pleasant but workmanlike film (not a hard prediction), the very definition of an “enh, I’ll check it out on Blu-ray” movie. But rest assured Solo’s troubled box office had nothing to do with nitwits who claim they managed to mastermind some ban after the “heresy” of The Last Jedi. The funniest part is that Solo was exactly the type of film those fans want—a movie completely compliant to the original trilogy, that tried to do nothing but provide non-stop fan service for older fans. Even if they had managed to affect the box office, the lesson Disney learned is that audiences love exciting, game-changing Star Wars movies like The Last Jedi, and don’t care about ho-hum supplements to the original films. Oh, man, I totally forgot about Glorious Godfrey and Virmin Vundabar. A few months back it was announced that Ava DuVernay had signed on to direct a New Gods movie sometime in the (barely) foreseeable future. For obvious reasons, this came as a huge surprise—but not a wholly unpleasant one. I never saw A Wrinkle in Time, but just from the trailers it seemed to me that DuVernay would be the perfect choice to bring Kirby’s crazy superhero sci-fi rock-opera vision to the big screen. As long as the art team could figure out how to make Mister Miracle’s mask look real, the final product would be perfect! But alas, as that hype wore off the reality of DC’s ridiculous movie schedule and the company’s current cinematic track record sunk in. So, Mister Postman, what do you think is the likelihood of the New Gods movie a) getting made, b) still having DuVernay as the director, c) being a good film, and d) sticking close-ish to Kirby’s artistic vision? The chances of the New Gods movie getting made is very low. Hell, the chances of any DC movie getting made is low. Warner Bros. announces things constantly, and it’s like some kind of secret bingo card has to be filled out for it to actually go into production. For example: Why is the non-DCEU Joker origin story currently filming, while the other three DCEU-based Joker movies—the Jared Leto-starring solo Joker film, the Joker and Harley film, and the Suicide Squad sequel—are trapped somewhere in WB’s cinematic limbo? The New Gods were created by Jack Kirby at the height of his brilliant trippiness, which is not something mass audiences are prepared for in the slightest. Hell, WB could barely get people to go to a Justice League movie; how many people do you think would show up for some crazy space-bible epic that stars characters named Granny Goodness and Mister Miracle? Not many. The problem with a New Gods movie is that the more accurate it tries to be to the source material, the less comprehensible it will be to audiences, and less enticing, too. Even if DuVernay and WB decided to focus on the Orion/Darkseid relationship and the New Genesis/Apokolips conflict...it’s probably still too weird for audiences. Maybe if Darkseid was first introduced in another Justice League movie, to give people a sort of bridge into this very, very bonkers universe...but this is still 100 percent not a movie the superhero-loving general populace wants. There are dozens of safer, more fiscally responsible film choices for WB to make. Of course, that doesn’t mean Warner Bros. won’t make it, because so little the studio does makes sense. Still, I fully expect it to eventually sink into development hell with Deathstroke, Deadshot, Gotham City Sirens, that Joker/Harley movie, etc., etc., and for DuVernay to eventually shrug her shoulders and exit the project. And then WB can announce Paul Thomas Anderson will be directing a Kamandi, the Last Boy on Earth movie starring Daniel Day-Lewis. Rick Grimes (Andrew Lincoln) does...I actually don’t know what the hell he’s doing. If zombies will relentlessly shamble toward anything that moves or makes a noise, pounding and clawing and scratching at any obstacle that gets in their way, wouldn’t the simple friction from moving their hands and feet pretty quickly wear away all the flesh, muscle and bone that allows them to move? Wouldn’t they all be reduced to motionless nubs within a matter of months? Not exactly. It’s not like a zombie spends all its time clawing at doors and walls to get at tasty meat; after the first few weeks of feasting when the zombie apocalypse begins, prey would be harder to come by—and most likely the snack would be caught and eaten within a couple of hours max, or escape, in which case the zombies would settle down in about the same time. The fingers don’t get a ton of use. Also to consider: Whatever the zombie virus does in terms of death and a desire for human flesh, it seems to also toughen the corpse at the same rate as the body rots, so as time goes on the remaining skin and muscles and ligaments continue enduring, allowing the zombie to keep shambling around for years. The toughened flesh can sometimes even manage to keep holding a bit of blood in it, keeping them juicy for extra gross kills. This should also probably help zombie fingers from getting knocked off or the feet from wearing completely away. Why do the CW superhero costumes have such large heads? It seems to be if you have a helmet or cowl there’s a lot of room up top to, I dunno, protect their hair? As we say in Scotland, they’ve got massive heids, ken. I don’t want to tell you how many hours I just spent looking at pictures of helmeted heroes in the DC/CW and DCEU universes, but suffice it to say your fake post-apocalyptic mailman has done his due diligence. That’s definitely a big melon. Image: The CW; Warner Bros. Despite the bajillions of dollars DC puts into its movies rather than its TV shows, it’s not like the movies have developed some nano-tech mask material only a few molecules thick. To sum up: Heads is big, masks is bigger. “Discworld” from iam8bit.com’s “ Postcards From Space” collection. I’m super excited about the Good Omens Amazon series. I love the book, and have always wanted to see an adaptation. So, with the resurgence of fantasy and cinematic universes and such, do you think we’ll ever see a big screen adaptation of one of the Discworld books? I know they did the animated version and the Sky TV made-for-TV movies, which were great, but I’m wondering if they would ever make a theatrical film. And is there a particular Discworld book you think would best lend itself to adaptation? I don’t expect to see ever see Discworld in theaters. The interesting thing about Terry Pratchett’s beloved fantasy series, besides being delightful, is that its main draw is the world itself—the entire world. That is to say, his Discworld series is more as the sum of its parts, rather than its individual volumes. While some books may stand out as better than others, none of them are so singular that they don’t benefit greatly from the others, and the wonderful world-building Pratchett does. This makes it hard to really pick one individual story, or even one individual book, to make a movie of, because it’s so enriched by the other books in the series. Small Gods is one of my favorite novels of Pratchett’s, and, as I remember it, it is wonderfully self-contained. But if you made a movie of it, you’d have to do so much explaining about the fantasy setting of Discworld that it makes it difficult to tell its story. At the very least, it makes it too risky to spend $200 million to put on screen in hopes audiences can wrap their heads around it. The stakes are lower on TV, which is why we’ve gotten those TV movies—and why the BBC finally greenlit a limited series called The Watch based on the Ankh-Morpork city guard stories back in March. They’re the perfect entry point into Discworld, because they’re (mostly) regular people in a (mostly) classic fantasy city, very easy for viewers new to the franchise to wrap their heads around. Plus, as limited series, it will have the time to do Pratchett’s book plots justice…and if it succeeds, then there’s plenty more source material starring the same characters to continue with. Still, I wouldn’t mind that Small Gods movie. Recent articles about the Captain Marvel movie have stated that it will not be an origin story, but that Carol will start out with her powers as a member of the Kree Starforce. Nerds have commonly been saying that we don’t need another origin story, but this is usually referring to Batman and Spider-Man, who have been rebooted multiple times (dead parents, dead uncle, we know). Do we need more backstory for a generally unknown character? Parts of Carol’s origin are problematic, so is the best choice to just ignore it? Are audiences actually now smart enough to accept someone can have superpowers without an explanation of how they got them? Don’t worry about it. There is a zero percent chance we won’t get to see the accident that gives Carol her superpowers. When Marvel says this isn’t an origin story, it means it’s not going to spend an hour with Carol before the Kree alien device blows up, and then she realizes something weird happened to her, and then she fights the bad guys. It means we’re only going to get a quick flashback to the moment she gets her powers. I mean, the trailer was all about her trying to recover her memories and figure out what happened to her in her past, yes? Most audiences have no idea who this character is or what her deal is. It has to address her origin; it just doesn’t have to spend a third of the movie on it. Works for me. All that said, it’s true that we the people never need to see Spider-Man and Batman’s origin literally ever again. Even in my post-apocalyptic wasteland, the poor children who grew up 40 years after all electronic visual mediums were destroyed in the Huge War know Spider-Man accidentally let Batman kill Uncle Ben, so Spidey murdered his parents in revenge. Do you have questions about anything sci-fi, fantasy, superhero, or nerd-related? Email the postman@io9.com or leave them in the comments. No question too difficult, no question too dumb. What Business Is Wayne Enterprises Actually In?